This article is about the professional basketball player. For the NASCAR driver, see Kevin Love (racing driver). Kevin Wesley Love (born September 7, 1988) is an American professional basketball player for the Cleveland Cavaliers of the National Basketball Association (NBA). He is a three-time All-Star and holds the longest streak for consecutive games recording double figures in points and rebounds since the ABA–NBA merger. Love won an NBA championship with the Cavaliers in 2016, and he was a member of the gold medal-winning USA men's national team at the 2010 FIBA World Championship and the 2012 Summer Olympics. He is the son of former NBA player Stan Love. A top ranked prospect out of Lake Oswego High School in Oregon, Love played one season of college basketball for the UCLA Bruins and led the team to a Final Four appearance in the 2008 NCAA Tournament. Love was named a consensus First Team All-American and was voted the player of the year in the Pac-12 Conference. He elected to forego his remaining three years of college eligibility and entered the 2008 NBA draft. He was taken fifth overall by the Memphis Grizzlies, and was traded to the Minnesota Timberwolves on draft night for the third overall selection, O. J. Mayo, in an eight-player deal. Love was traded to the Cavaliers in 2014. Love was born on September 7, 1988 in Santa Monica, California, the second of three children to Karen and Stan Love. He grew up in Oregon and played basketball from his earliest days; as a child, he would practice his bounce passes with a cardboard box and study tapes of Wes Unseld. Love played high school basketball for the Lake Oswego Lakers. In his sophomore season, he averaged 25.3 points, 15.4 rebounds, and 3.7 assists per game, leading the Lakers to the 2005 state championship game where they lost to Jesuit High School. The following summer, he was the center of controversy when Nike removed him from its Portland Elite Legends AAU team because he had chosen to participate in the Reebok ABCD Camp against other top recruits. He went on to play for the Southern California All-Stars, helping the team compile a 46–0 record while garnering three MVP awards. In his junior year, he averaged 28 points, 16.1 rebounds, and 3.5 assists per game as Lake Oswego returned to the state championship game, this time winning behind Love's 24 points and 9 rebounds. In his senior season, he averaged 33.9 points, 17.0 rebounds, and 4 assists per game. Lake Oswego made their third straight trip to the state championship game, losing in a rematch of the prior year's final to South Medford High School and Love's rival Kyle Singler despite 37 points from Love. At the conclusion of the season, Love was named the Gatorade National Male Athlete of the Year. He was also a first-team Parade All-American. He finished his high school career as the all-time leading scorer in Oregon boys' basketball history with 2,628 points. Love followed up this new contract extension the subsequent night with a 31-point performance in a win over the Dallas Mavericks. In January 2012, Love scored 30 points in three consecutive games for the first time in his career. He began the season recording 15 straight double-doubles, the first player to do so since Hakeem Olajuwon in the beginning of the 1992–93 NBA season. On January 20, 2012, Love made a three-point buzzer beater to defeat the Los Angeles Clippers. On February 6, 2012, Love was given a two-game suspension for stepping on the face of Luis Scola. After the game on February 4, Love said, "I mean, he fell down after the play. He just kind of laid there and... I just happened to be there. I had nowhere to go. I got kind of tripped up and I just had nowhere to step. He was right there... and it happened to be his face." On February 25, 2012, Love participated in the Three-Point Shootout and defeated Kevin Durant in the final tie-breaking round to win the contest. Love scored a season high 42 points in a win over the Portland Trail Blazers on March 3, 2012. Love set a franchise record for most games scoring over 30 points in a season on March 12, 2012 in a victory over the Phoenix Suns. He also had a career-high 51 points in a 149–140 double overtime loss to the Oklahoma City Thunder. The following game, Love erupted for 30 points and grabbed 21 rebounds in a win over the Denver Nuggets. For the season, Love was named to the All-NBA second team and finished sixth in MVP voting. In the offseason, Love voiced frustration with Minnesota for not being a playoff team. The Timberwolves finished with the Western Conference's fourth-worst record at 26–40, which was still the franchise's most wins since the 2006–07 season. On February 22, 2014, Love recorded his first career triple double with 37 points, 12 rebounds and a career-high 10 assists in a 121-104 win over the Utah Jazz. On March 9, Love, with a 3-pointer midway through the third quarter of Minnesota's 104-111 loss to the Raptors, broke the Timberwolves’ franchise record for 3-pointers in a season. With that make (143), he passed Rashad McCants' record of 142 in the 2007–08 season. On March 28, he recorded his second career triple double with 22 points, 10 rebounds and 10 assists in a 143-107 win over the Los Angeles Lakers. On April 2, 2014, Love recorded his third career triple double with 24 points, 16 rebounds and 10 assists in a 102-88 win over the Memphis Grizzlies. Love set an NBA record in 2013–14, becoming the first player in NBA history to record 2,000 points, 900 rebounds and 100 3-pointers in a single season. He was named to the All-NBA Second Team for the second time in his career. Love helped the Cavaliers win 34 of their final 43 games to finish the regular season as the No. 2 seed in the Eastern Conference with a 53–29 overall record. In his first career playoff game on April 19, Love recorded 19 points and 12 rebounds in a 113–100 win over the Boston Celtics in Game 1 of their first-round playoff match-up. Cleveland swept the series 4–0, but Love missed the remainder of the playoffs after he dislocated his left shoulder in the first quarter of Game 4 when he got tangled with the Celtics' Kelly Olynyk while battling for a loose ball. Love called it a "bush-league play", while Olynyk said he would "never intentionally hurt someone." The league ruled that Olynyk had "yanked Love's arm down", and suspended Olynyk for one game. Love underwent surgery to repair his shoulder and the team said he would need four to six months to recover. On October 25, 2016, after receiving his first championship ring prior to the season opener, Love recorded 23 points and 12 rebounds in a 117–88 win over the New York Knicks. On November 3, he scored a then season-high 26 points in a 128–122 win over the Boston Celtics, helping the Cavaliers go 5–0 for the first time since 1976–77 when they started 8–0. On November 23, he scored 40 points, including an NBA-record 34 in the first quarter, to help the Cavaliers defeat the Portland Trail Blazers 137–125. His 34 points were the second most all-time in a quarter; Klay Thompson of the Golden State Warriors set the record at 37 in the third quarter on January 23, 2015. Five days later, he was named Eastern Conference Player of the Week for games played Monday, November 21 through Sunday, November 27. Love led the Cavaliers to a 3–0 week behind an East-leading 30.7 points per game. Love appeared on the front cover for the video game NCAA Basketball 09. He was one of the featured stars in the film Gunnin' for That No. 1 Spot. He appeared as himself on the Disney Channel show The Suite Life on Deck during the season 3 episode Twister: Part 1 along with Dwight Howard and Deron Williams. He appeared in the HBO television series Entourage in its seventh season finale Lose Yourself. 1 2 "Kevin Love passes Moses Malone". ESPN. Associated Press. March 9, 2011. Retrieved March 9, 2011. 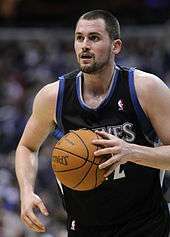 1 2 "USA Basketball: Kevin Love". USA Basketball. Retrieved August 25, 2014. 1 2 Branch, John. "Having Fun, Fun, Fun as a Freshman at U.C.L.A.". The New York Times. Retrieved August 25, 2014. ↑ Jenkins, Lee. "Love finally has a pair of enticing reasons to stay in Minnesota". Sports Illustrated. Retrieved August 25, 2014. ↑ "Kevin Love NBA & ABA Stats". Basketball Reference. Retrieved August 25, 2014. 1 2 3 4 5 6 "UCLA Player Bio: Kevin Love". UCLABruins.com. Archived from the original on February 23, 2011. 1 2 "OSAA Boys' Basketball State Champions" (PDF). Oregon School Activities Association. Retrieved April 27, 2007. 1 2 Jung, Helen (26 July 2006). "Love and sneaker wars". The Oregonian. Retrieved October 19, 2010. ↑ Stewart, Bill (12 April 2007). "Awards pile up for Kevin Love". Lake Oswego Review. Retrieved February 9, 2010. ↑ Carpenter, Holly (10 March 2007). "South Medford takes title". The Oregonian. Retrieved October 18, 2010. ↑ Katz, Andy (25 July 2006). "Love-fest: Hoop phenom says he'll attend UCLA". ESPN. Retrieved October 16, 2010. ↑ Pucin, Diane (9 November 2008). "Love signs, makes Howland's day". Los Angeles Times. Retrieved October 19, 2010. ↑ "Kevin Love 2007 Basketball Recruiting Profile". ESPN. Retrieved October 18, 2010. ↑ Parikh, Sagar (6 April 2006). "Hazzard to give up number". The Daily Bruin. Retrieved February 21, 2007. ↑ Katz, Andy (October 22, 2007). "Love reaches out to the Wizard for advice, history". ESPN. Retrieved October 22, 2007. ↑ Wahl, Greg (26 February 2008). "Over the Top". SI.com. Retrieved March 5, 2008. ↑ Streeter, Kurt (31 January 2008). "University must enforce an attitude adjustment in fans". Los Angeles Times. Retrieved July 15, 2010. ↑ "Wolves sign Love". NBA. July 11, 2008. Retrieved February 7, 2010. ↑ Staff Writer (April 18, 2008). "UCLA's Love says he's headed to the NBA". ESPN. Retrieved February 7, 2010. ↑ Ford, Chad (June 27, 2008). "Mayo heads to Memphis, Love to Minnesota in blockbuster trade". ESPN. Retrieved February 7, 2010. ↑ Staff Writer (June 17, 2008). "O. J. Mayo, Kevin Love trading places in eight-player swap". USA Today. Retrieved February 22, 2010. ↑ "2008 NBA Summer League Statistics". NBA. ↑ Krawczynski, Jon (October 29, 2008). "Love's efficient night helps Wolves escape". Yahoo! Sports. Associated Press. Retrieved February 25, 2010. ↑ Staff Writer (December 8, 2008). "4–15 Minnesota Timberwolves fire Randy Wittman". ESPN. Retrieved February 25, 2010. ↑ Zgoda, Jerry (June 25, 2008). "Kevin Love a mirror image of McHale". Star Tribune. Retrieved February 26, 2010. ↑ Bolch, Ben (January 20, 2009). "Kevin McHale really likes Kevin Love". Los Angeles Times. Retrieved February 26, 2010. ↑ Imus, Karly (July 23, 2009). "Kevin Love looking for bigger, better achievements". The Oregonian. Retrieved February 28, 2010. ↑ Stephens, Jerry (February 5, 2009). "Former Lake Oswego star, Kevin Love becomes a marquee name thanks to McHale". The Oregonian. Retrieved October 18, 2010. ↑ Staff Writer (January 29, 2009). "McHale: Love's rookie game snub 'utterly ridiculous'". USA Today. Retrieved February 28, 2010. ↑ Zgoda, Jerry (January 29, 2009). "Wolves upset over Love's omission from showcase". Star Tribune. Retrieved October 17, 2010. ↑ Staff Writer (February 9, 2009). "Jefferson has torn ACL in right knee". ESPN. Retrieved February 28, 2010. ↑ Official Release (April 3, 2009). "Bulls' Rose, Wolves' Love named Rookies of the Month". Retrieved February 28, 2010. ↑ "Kevin Love Named to All-Rookie Second Team". NBA. Retrieved May 26, 2009. ↑ Howard-Cooper, Scott (August 17, 2009). "Love, Team USA begin courtship". SI.com. Retrieved July 14, 2010. ↑ "Kevin Love Selected To Participate In Mini-Camp". NBA. Retrieved July 14, 2010. ↑ Staff Writer (June 17, 2009). "Love: McHale won't return". ESPN. Retrieved March 10, 2010. ↑ "Wolves' Love likely to miss six weeks". ESPN. August 17, 2009. Retrieved July 14, 2010. ↑ Zgoda, Jerry (December 5, 2009). "Wolves' Love impressive, but Hornets' Paul trumps him in his return". Star Tribune. Retrieved July 14, 2010. ↑ Aschburner, Steve (December 5, 2009). "From Minnesota with Love: Wolves finally looking better". NBA. Retrieved July 14, 2010. ↑ "TIMBERWOLVES: NBA All-Stars Central 2010". NBA. Retrieved July 26, 2012. ↑ Blinebury, Fran (February 13, 2010). "Rooks grab rare win over NBA sophomores". NBA. Archived from the original on March 6, 2011. 1 2 Mannix, Chris (November 13, 2010) Memo to Timberwolves: Love is a talent worth developing. SI.com. ↑ "Kevin Love posts NBA's 1st 30–30 game in 28 years as Knicks fade in 4th". Associated Press. November 12, 2010. Retrieved November 12, 2010. ↑ Krawczynski, Jon (November 12, 2010). 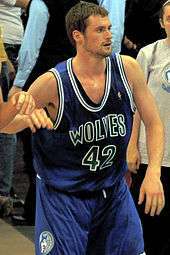 "Kevin Love grabs 31 rebounds, scores 31 points to rally Wolves to 112–103 win over Knicks". Associated Press. Retrieved November 12, 2010. ↑ Krawczynski, Jon (November 12, 2010). "Love has 30–30 game in Wolves' win over Knicks". USAToday. Retrieved November 12, 2010. ↑ "Kevin Love's career night not enough for Minnesota against Denver". ESPN. Associated Press. December 18, 2010. Archived from the original on February 28, 2011. ↑ "NBA announces All-Star reserves". ESPN. February 4, 2011. Archived from the original on February 4, 2011. ↑ "Kevin Love selected as final All-Star". ESPN. February 4, 2011. Archived from the original on February 4, 2011. ↑ Deveney, Sean (February 4, 2011). "Kevin Love named injury replacement in All-Star Game". SportingNews.com. Archived from the original on February 5, 2011. ↑ "Kevin Love sets Minnesota mark with 38th consecutive double-double". ESPN. Associated Press. February 8, 2011. Archived from the original on February 9, 2011. ↑ "Kevin Love's 46th straight double-double helps Wolves snap skid". ESPN. Associated Press. February 27, 2011. Archived from the original on February 28, 2011. 1 2 "Kevin Love's double-double streak ends at 53 in Wolves' loss against Warriors". ESPN. Associated Press. March 13, 2011. ↑ "Trevor Ariza, Chris Paul lift Hornets past reeling Timberwolves". ESPN. Associated Press. February 25, 2011. Retrieved February 26, 2011. Malone also had a 51-game run from 1979–80. ↑ Beilby, Jim (February 23, 2011). "Grizzlies-Wolves notebook". NBA. Retrieved February 25, 2011. The next longest streak is also Malone's, who tallied a 51 game streak of double-doubles spanning the 1978–79 and 1979–80 seasons. ↑ Narducci, Marc (March 4, 2011). "Love's mastery of the double-double could be troublesome for 76ers". The Philadelphia Inquirer. Archived from the original on March 10, 2011. ↑ "Elias Says...". ESPN. Elias Sports Bureau. March 10, 2011. Archived from the original on March 10, 2011. ↑ "Kevin Love could miss rest of season". ESPN. Associated Press. March 24, 2011. Retrieved March 24, 2011. Love sat out Thursday night's game against Dallas after he was hurt in a 127–95 home loss to Sacramento on Sunday. 1 2 "Rockets send Timberwolves to 15th straight loss". ESPN. Associated Press. April 13, 2011. Archived from the original on April 14, 2011. ↑ "Rockets-Timberwolves Preview – April 12, 2011". CBSSports.com. Associated Press. April 12, 2011. Archived from the original on April 14, 2011. ↑ "Wolves' Love wins Kia Most Improved Player Award" (Press release). NBA Media Ventures, LLC. April 21, 2011. Archived from the original on April 21, 2011. ↑ "Report: Kevin Love wins Most Improved". ESPN. Associated Press. April 21, 2011. Archived from the original on April 21, 2011. ↑ Walters, Charley (June 20, 2011). "Shooter Now: Rubio's No. 9 jersey expected to be most anticipated seller in Timberwolves' history". twincities.com. Retrieved June 20, 2011. 1 2 Spears, Marc J. (July 9, 2012). "Kevin Love losing patience with Timberwolves' losing, wants roster upgraded". yahoo. Archived from the original on July 9, 2012. ↑ Stein, Marc; Broussard, Chris (January 25, 2012). "Kevin Love, Wolves agree to deal". ESPN. Archived from the original on January 25, 2012. ↑ Stein, Mark. "Kevin Love, Wolves agree to deal". sports.yahoo.com. Accessed September 30th 2013. 1 2 "Minnesota Timberwolves vs. Dallas Mavericks – Box Score – January 25, 2012". ESPN. January 25, 2012. Retrieved July 26, 2012. 1 2 "Kevin Love, strong backcourt lead Wolves past Kings". ESPN. Associated Press. January 16, 2012. Archived from the original on January 17, 2012. ↑ Yahoo! Sports 7 hours, 48 minutes ago. "Timberwolves Team Report – NBA – Yahoo! Sports". Sports.yahoo.com. Retrieved July 26, 2012. ↑ "FINAL". NBA. Retrieved July 26, 2012. ↑ "Wolves' Love finishes sixth in NBA MVP voting". Foxsportsnorth.com. May 12, 2012. Retrieved July 26, 2012. ↑ "Kevin Love: 'I want to win'". ESPN. July 9, 2012. Archived from the original on July 9, 2012. ↑ "Timberwolves' Kevin Love out 6-8 weeks with broken hand". USA Today. October 17, 2012. Retrieved October 17, 2012. ↑ "Kevin Love makes season debut". Associated Press. Retrieved November 21, 2012. ↑ "Kevin Love unsure about Timberwolves' future – Yahoo! Sports". sports.yahoo.com. Retrieved November 11, 2014. ↑ "Wolves Forward Kevin Love To Undergo Surgery On Right Hand". NBA.com. Retrieved January 10, 2013. ↑ "Kevin Love out 8-10 weeks for Timberwolves with broken hand". USA Today. Associated Press. January 9, 2013. Retrieved January 11, 2013. ↑ Aschburner, Steve. "Rescue Timberwolves? Rubio's return could rev them up". NBA.com. Retrieved January 10, 2013. ↑ "Love's hand is healing; shot still hurting". Retrieved January 10, 2013. ↑ "Kevin Love traded to Cavaliers". ESPN. August 23, 2014. Retrieved August 23, 2014. ↑ "Cavs Acquire All-Star Forward Kevin Love". NBA.com. Turner Sports Interactive, Inc. August 23, 2014. Retrieved August 23, 2014. ↑ "Love gets message from LeBron, scores 32 in Cavs' win". NBA.com. Turner Sports Interactive, Inc. February 8, 2015. Retrieved February 8, 2015. ↑ "Love hits 8 3-pointers, Cavaliers beat Pistons 102-93". NBA.com. Turner Sports Interactive, Inc. February 24, 2015. Retrieved February 25, 2015. 1 2 Haynes, Chris (April 29, 2015). "Kevin Love undergoes surgery on dislocated shoulder, out 4-6 months". Cleveland.com. Archived from the original on April 30, 2015. ↑ Haynes, Chris (April 27, 2015). "Kevin Love shoulder injury: Cleveland Cavaliers forward out for entire Eastern Conference semifinals". Cleveland.com. Archived from the original on April 27, 2015. ↑ "Smith, Olynyk suspended; Perkins fined" (Press release). NBA. April 27, 2015. Archived from the original on April 27, 2015. ↑ Stein, Marc (June 24, 2015). "Kevin Love opts out of deal with Cavaliers". ESPN. Retrieved June 25, 2015. ↑ "Cavaliers Re-sign Forward Kevin Love". NBA.com. July 9, 2015. Retrieved July 11, 2015. ↑ "LeBron joins "Big O" on elite list, leads Cavs past Magic". NBA.com. November 23, 2015. Retrieved November 24, 2015. ↑ "Love, Irving sharp as Cavaliers beat Pistons 114-106". NBA.com. January 29, 2016. Retrieved January 30, 2016. ↑ "Big 3 back together, lead Cavs to 106-101 win over Pistons". NBA.com. April 17, 2016. Retrieved April 18, 2016. ↑ "James scores 33, Cavaliers reach second straight NBA Finals". NBA.com. May 27, 2016. Retrieved May 27, 2016. ↑ Siddiqi, DJ (June 18, 2016). "LeBron James: If we win, no one will criticize Kevin Love". 247sports.com. Retrieved June 19, 2016. ↑ "Cavaliers stay unbeaten with 128-122 win over Celtics". ESPN.com. November 3, 2016. Retrieved November 4, 2016. ↑ "Love scores 40, including 34 in 1st, James has triple-double". ESPN.com. November 23, 2016. Retrieved November 24, 2016. ↑ "Kevin Love, Kevin Durant named Players of the Week". NBA.com. November 28, 2016. Retrieved November 29, 2016. ↑ "Love Named A Finalist For The 2012 U.S. Olympic Team". NBA. January 16, 2012. Archived from the original on January 25, 2012. ↑ Windhorst, Brian (July 26, 2014). "Kevin Love pulls out of Team USA". ESPN. Archived from the original on July 26, 2014. ↑ Harris, Beth (February 9, 2008). "Kevin Love's old-school game, maturity make him a college throwback at UCLA". USA Today. ↑ Berger, Ken (March 4, 2010). "St. Jude utilizes power of Love, NBA in fight against cancer". CBSsports.com. Retrieved March 20, 2012. ↑ Eggers, Kerry (December 1, 2011). "You'll see less of Love this season". The Portland Tribune. Archived from the original on May 15, 2012. ↑ Mehta, Stephanie N. (May 23, 2012). "NBA's Kevin Love is latest player in celeb-tech mashup". CNN. Retrieved July 26, 2012. ↑ Gustashaw, Megan (March 3, 2016). "Cavaliers Player Kevin Love is the New Face of Banana Republic". GQ.com. Retrieved August 2, 2016. ↑ "Kevin Love on the cover of NCAA Basketball 09". BruinsNation.com. Retrieved April 23, 2012. ↑ "Dwight, Kevin Love, DWill on 'The Suite Life'". Slamonline.com. January 6, 2011. Retrieved July 26, 2012.